George Kelham is a precise man. Given that he has spent almost 40 years working in the helicopter industry, many of which have been at one end of a long line, perhaps that’s not too surprising. But this precision is also reflected in his ability to pluck exacting details about his career from the top of his head without a moment’s hesitation. His first job in the industry–for Calgary-based Kenting Helicopters–began on Jan. 1, 1981; he first arrived in Slave Lake, Alta.–the town that would become his home for the rest of his career–on Sept. 1, 1983; and when he and his wife, Debbie, established their company, Slave Lake Helicopters, they received their operating certificate from Transport Canada on Jan. 26, 1998. “The reason I know that one is because it happens to be Wayne Gretzky’s birthday, and I’m a big hockey fan!” he told Skies. He and Debbie started Slave Lake Helicopters with one leased Bell 206L-1 LongRanger, and found they greatly enjoyed the challenges and opportunities that being company owners presented. 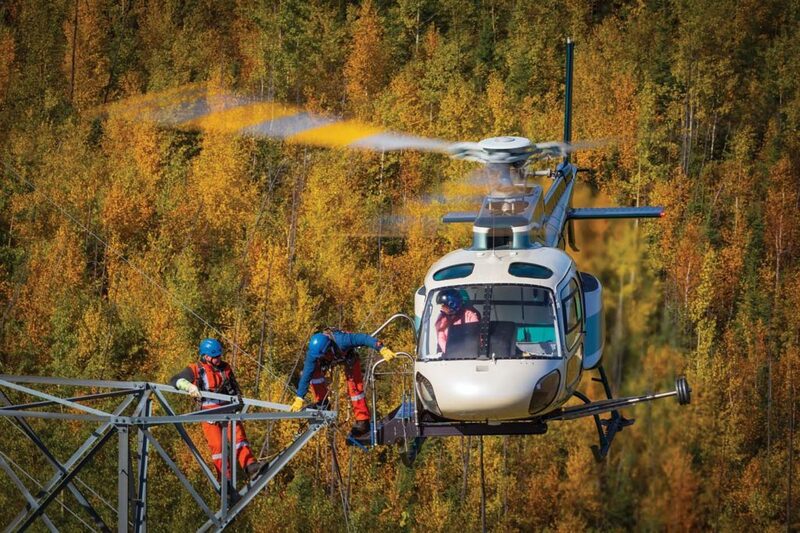 Slave Lake Helicopters proved an immediate success, keeping busy throughout its first season. “The biggest regret I have is that I should have started my own business sooner,” said George Kelham. The first season was such a success that they were able to buy the company’s first helicopter–a used Airbus AS350 BA–the following year. 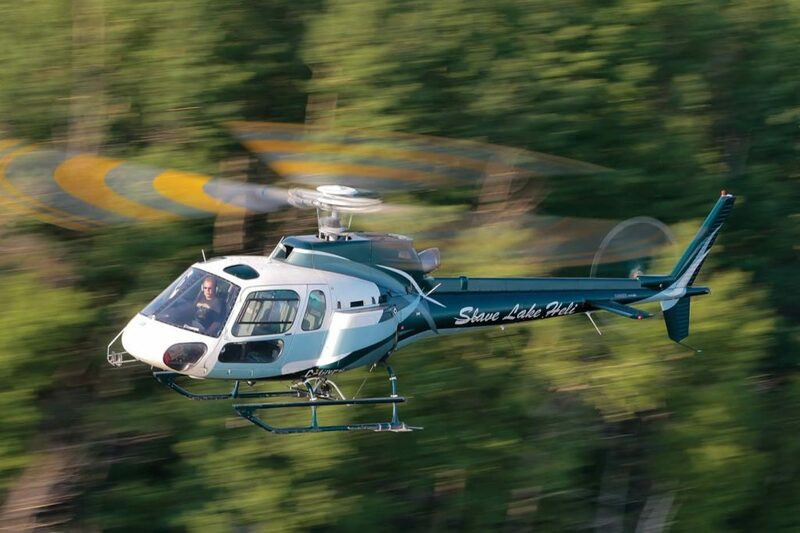 Today, Slave Lake Helicopters has a fleet of seven owned aircraft, including two Airbus H125s, three AS350 B2s, one H120, and one Bell 206 Jet Ranger. The company operates from two modern hangars at its facility at Slave Lake airport, on the edge of the small town of Slave Lake. The settlement lies in the geographic center of the province of Alberta, about 125 miles (200 kilometers) northwest of Edmonton, and 125 miles (200 kilometers) southwest of Fort McMurray. Serving as the hub for many smaller communities in the region, Slave Lake sits on the southeast shore of Lesser Slave Lake, which spans 450-square-miles (1,160-square-kilometers), and is surrounded by forests, rivers and smaller lakes. 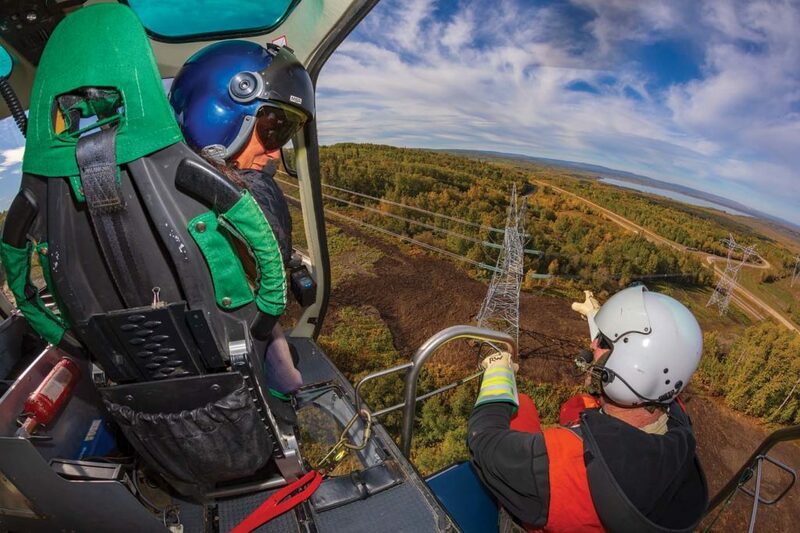 In this environment, Slave Lake Helicopters has developed a specialization in forestry-related work–planting trees and fighting forest fires–as well as powerline patrol and powerline maintenance. Tree planting was one of the main sources of work in the company’s first year of operation, and remains so to this day. 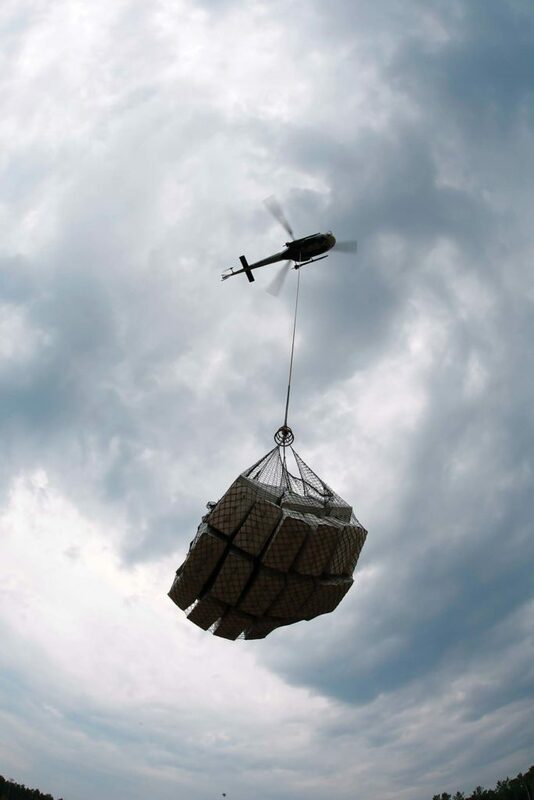 Slave Lake Helicopters has about five mills providing them with this work, which entails flying boxes of young coniferous trees–typically pine or spruce–to locations that are otherwise inaccessible in the summer. Over the course of the last 21 years, Kelham estimates Slave Lake Helicopters has helped plant about 125 million trees, at a current rate of about eight to 10 million trees per year. 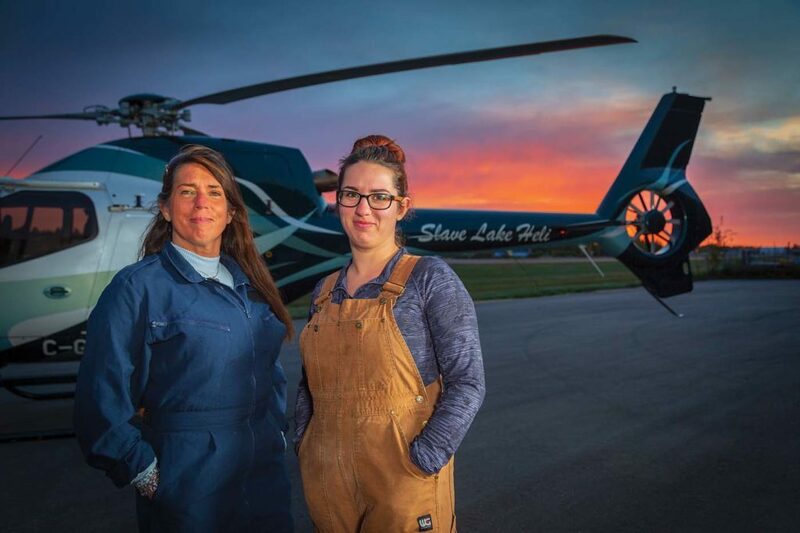 Other longstanding operations for Slave Lake Helicopters include fighting wildfires, powerline construction, oil-and-gas support, and wildlife management. But the company has also shown a desire to evolve, instigating two new specialist programs–one of which is unique within Canada. Both have been developed and led by project manager Andrea Pelletier. The first was the “AStep” program, in which a custom-designed platform installed on the starboard side of an AStar is used to transfer linemen to powerline towers for maintenance operations. 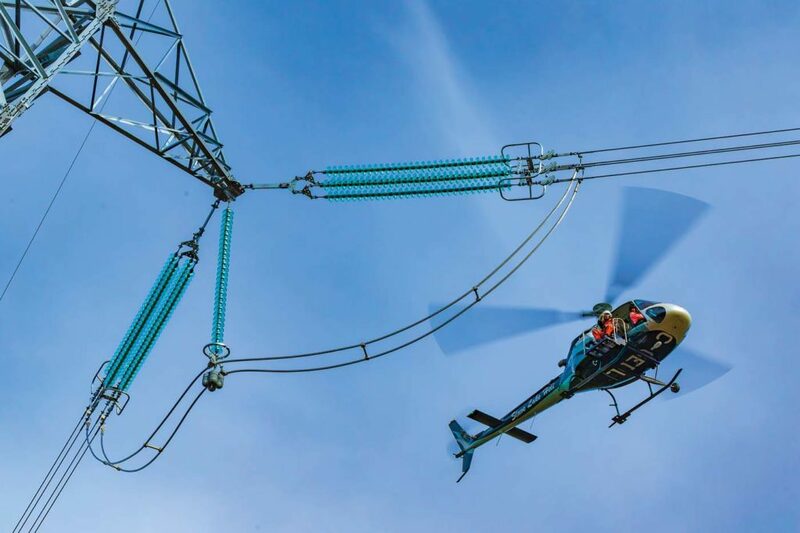 Typically, one aircraft works with six linemen, transporting two at a time from the staging area to the structure, and then moving them two at a time throughout the day. 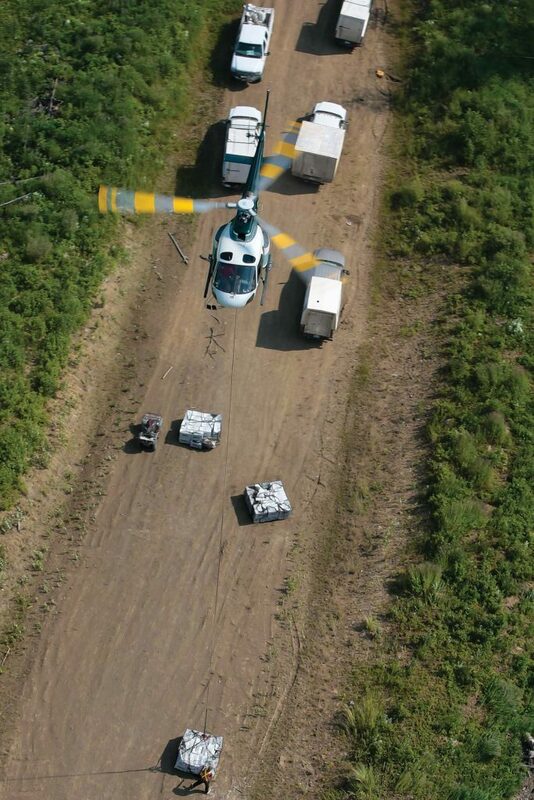 Following a patrol of the line to identify any hazards, the team begins the transfer process. 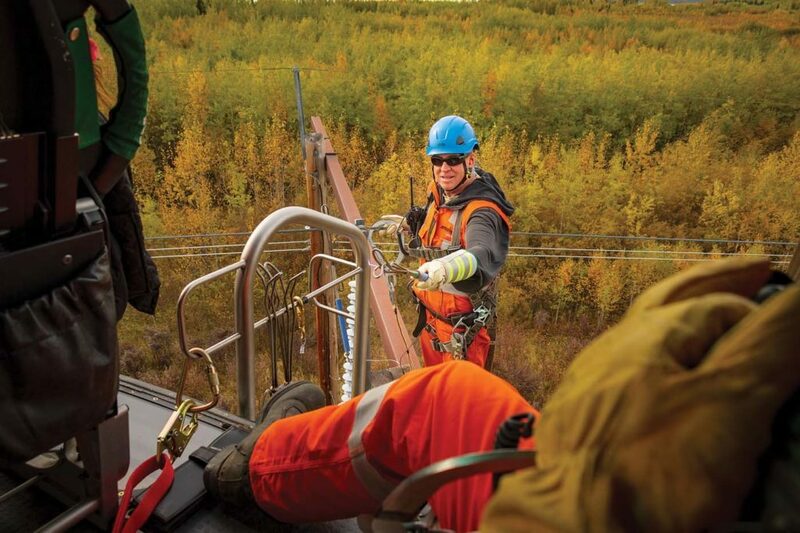 “When we’re ready to transfer a lineman, the approach is the first step in the operation,” said Pelletier. “We have certain standard calls we use. 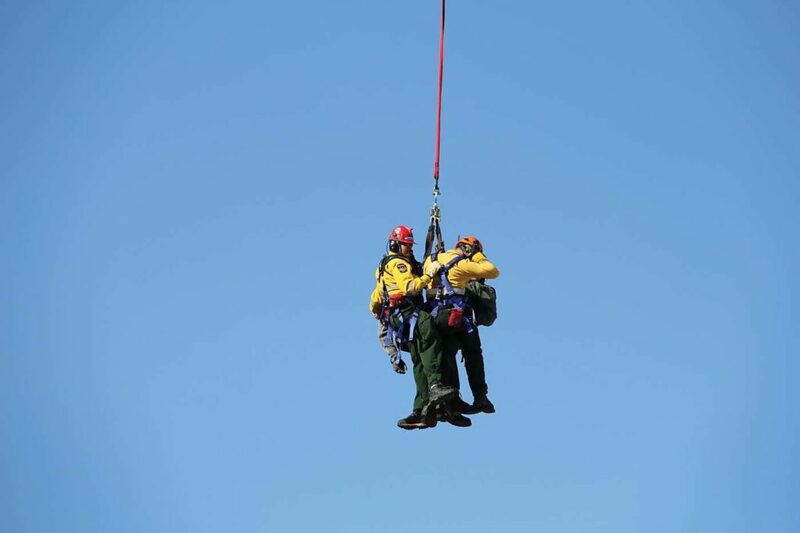 During the approach, the lineman will get up from the cabin and he will step on the platform, and he will do certain maneuvers to get ready to bond onto the structure. The entire finely-tuned procedure is scripted in detail to ensure it follows an exact pattern. 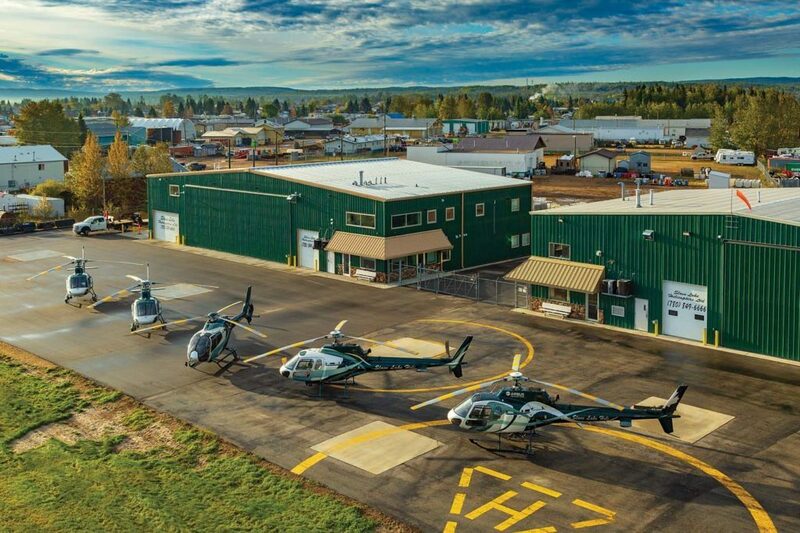 The program required a large investment from Slave Lake Helicopters to develop and implement (the company owns the supplemental type certificate for the step), but the oil-and-gas market took a nosedive just as the company began operations with the AStep. This has restricted its use to around 50 hours a year, but Kelham hopes to grow this to around 250 hours a year once the oil-and-gas sector has recovered. The second program is a pilot project to explore the use of human external cargo (HEC) operations during wildfire fighting operations. The program, which has only just completed its first season, is a two-year pilot project being conducted in collaboration with Alberta Agriculture and Forestry. Essentially, the operation sees firefighters transported to wildfires on a long line. “The pilot will land, hook up the firefighters to the long line, and insert them into the fire,” said Kelham. “The pilot will then go back to the staging area, remove the HEC line, put the long line on with the bucket, go back, and feed these guys water and try to hold the fire. Without the HEC system, the firefighters have to walk to the fire from a staging area (which could be over a mile), or build a landing pad near to the fire (which can take several hours). Slave Lake Forest Area Firefighter Coordinator Mike Turcotte said he first tried the system in July 2017, and as soon as he was airborne he realized it could be very beneficial to wildfire operations in Alberta. 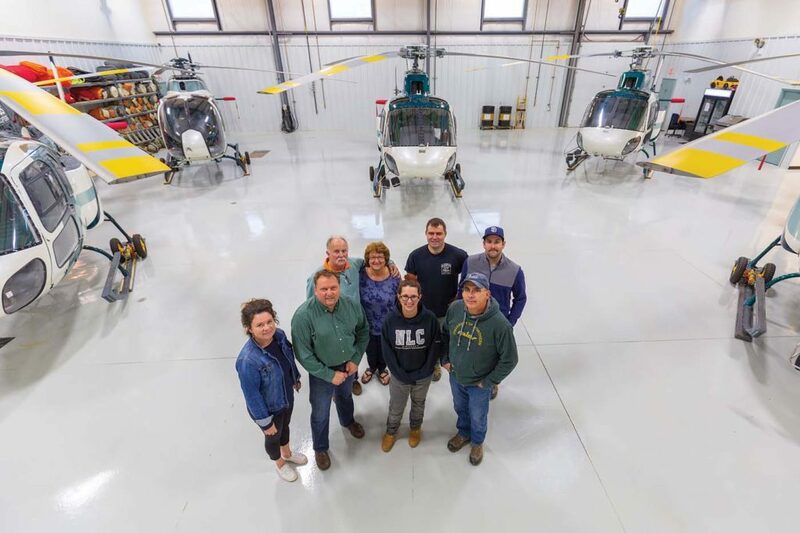 Slave Lake Helicopters uses an Airbus H125 for the work–and Kelham said it was the only type the company would consider using for it. As with the AStep program, Pelletier serves as the project manager of the HEC trial at Slave Lake Helicopters. 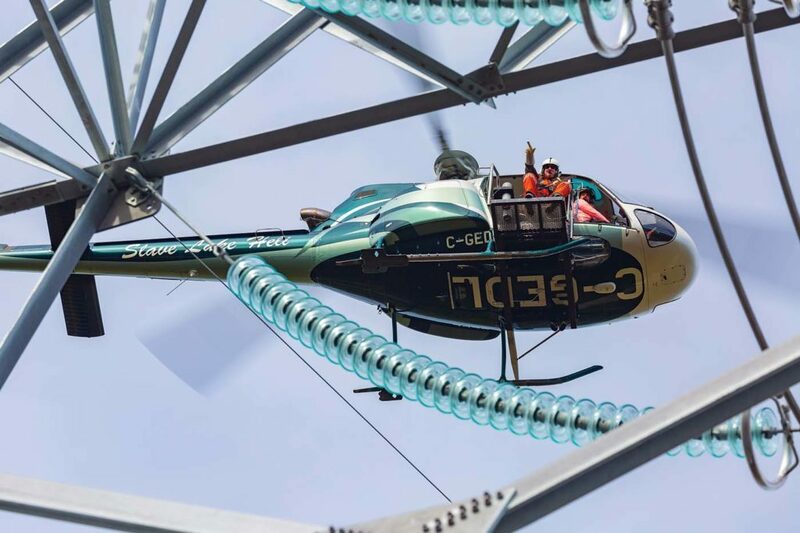 She had been exploring the possibility of using HEC to sling firefighters to wildfires for several years before Alberta Agriculture and Forestry decided to launch a pilot project, awarding the contract to Slave Lake Helicopters. Before completing crew resource management training with the two crews of firefighters assigned to the program, all pilots had to complete a test on HEC operations that is used throughout North America. Slave Lake had three pilots qualified to perform the HEC operations last summer, providing ample backup to each other for the one machine dedicated to the work. The teams used three lengths of long line–100 feet, 150 feet, and 200 feet–and the operation would follow a set routine. First the firefighters’ bags of equipment would be flown from the staging area to the fire, then the firefighters themselves–four at a time–along with more bags on the line underneath them. After many weeks of practice, the team performed their first HEC insertion on a fire in May 2018. Pelletier agreed that the extended training time made it an easy transition to active operations. 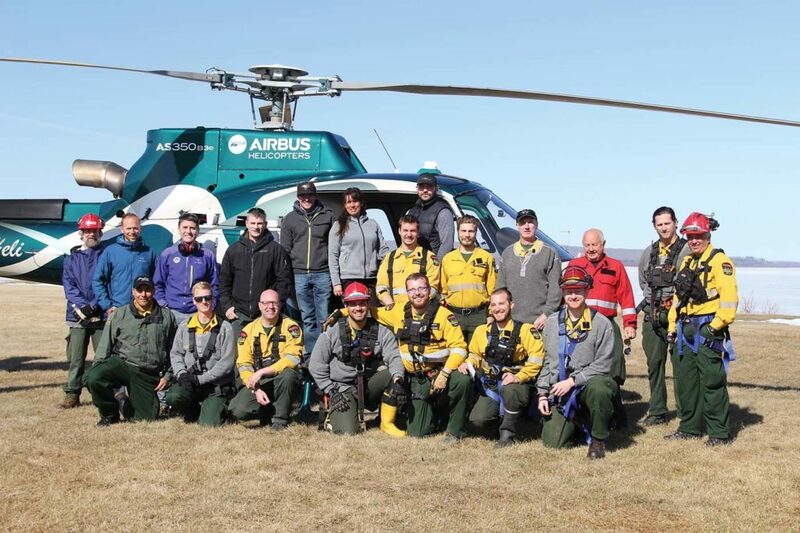 Over the first summer of HEC firefighting operations, one of Slave Lake’s pilots alone performed 262 HEC cycles (insertion and extraction) — a huge volume of work for this type of operation. Kelham said his company was the only one he knew of in Canada that is approved for HEC work for firefighting — but that it is restricted to that specific operation. “Right now we are Transport Canada-approved for insertion and extraction with a single engine [helicopter] on emergency use only,” said Kelham. Pelletier said she was pleased with how the first year of the pilot program had gone. “This year was a success, and now Alberta Agriculture and Forestry are evaluating,” she said. The program will continue next summer. The fleet is largely rested over the winter, with only operations for established customers continuing over the coldest months of the year. “[Winter operations] are hard on the helicopters,” said Kelham. 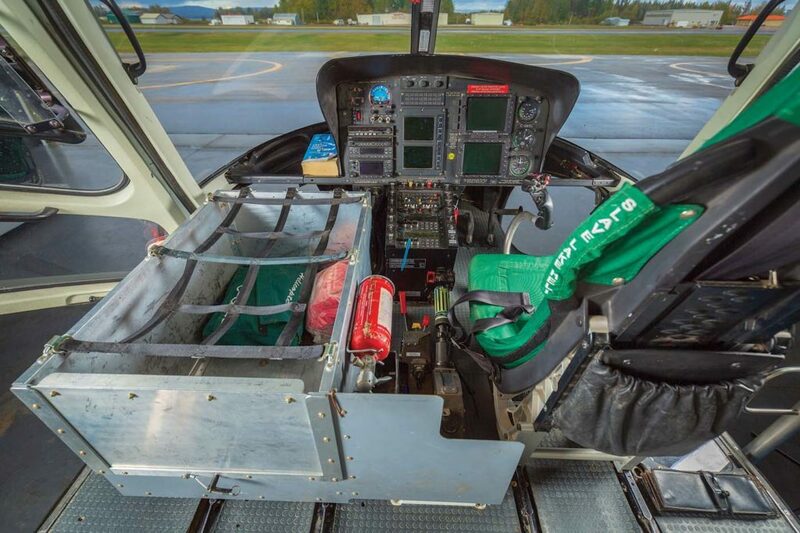 Depending on the year, Slave Lake Helicopters can fly anywhere from 2,200 hours to 2,800 hours across its fleet. “My target is 3000 fleet hours with seven helicopters. If I could get 3,000 fleet hours, I’d be very happy,” said Kelham. The company worked from a single hangar until this year, when its fleet had expanded to such a point that it needed a secondary space to fit them all. It purchased land directly east of its existing building to create a slightly larger hangar. The original hangar is now dedicated to maintenance work and administration, while the newer hangar is the base for operations. The maintenance hangar gives all the engineers their own workstation, with a desk, chair and computer; while the operations hangar contains a pilot ready room, a classroom, and a reception area for customers. 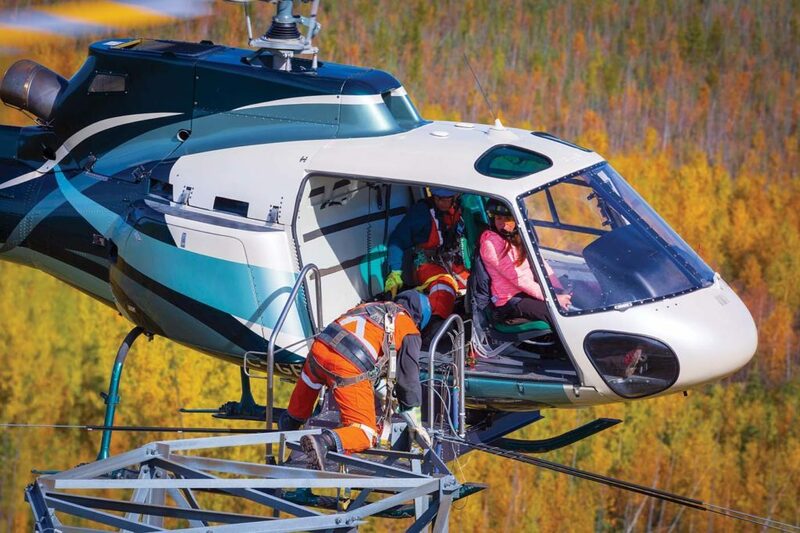 The company’s engineers provide non-specialized maintenance–any specialized work is sent out–but that still allows them to perform about 90 percent of the work they need to do in-house, said Jeff Nagy, Slave Lake Helicopters’ director of maintenance. The company has a full-time staff of 10, with four more pilots and one engineer hired during the peak summer months. Leroy Dean was the first pilot Kelham hired, back in 2004. The two have known each other for more than 35 years. An industry veteran, Dean has now recorded around 21,000 flight hours over his career. Pelletier is another experienced employee, having been with the company 10 years–spread either side of a period working at Transport Canada. Kelham believes the biggest challenge of having an operation in Slave Lake is finding and attracting the right staff to do the right job. He understands that a small town in rural Alberta might not hold the appeal of other locations to some people, but hopes that treating his staff well, providing good facilities and equipment, and providing good work helps to compensate. And it’s an approach that appears to have worked, given the longevity and loyalty of many of Slave Lake Helicopters’ staff. For her part, Pelletier says the opportunity to work on such interesting programs has also proved appealing. “We hoped the two programs would attract more specialized, qualified and passionate people, and they did. It worked,” she said. For now, he’s happy with the direction of the company and proud of what he and Debbie have created. “We’ve obviously done something right,” he said. “We’ve built a very nice company.” And with the next generation of Kelham joining the company this last summer–the couple’s son, Taylor, now works as logistics and operations coordinator–the Kelham name looks set to play a significant role in this part of the rotary-wing world for a long time to come.